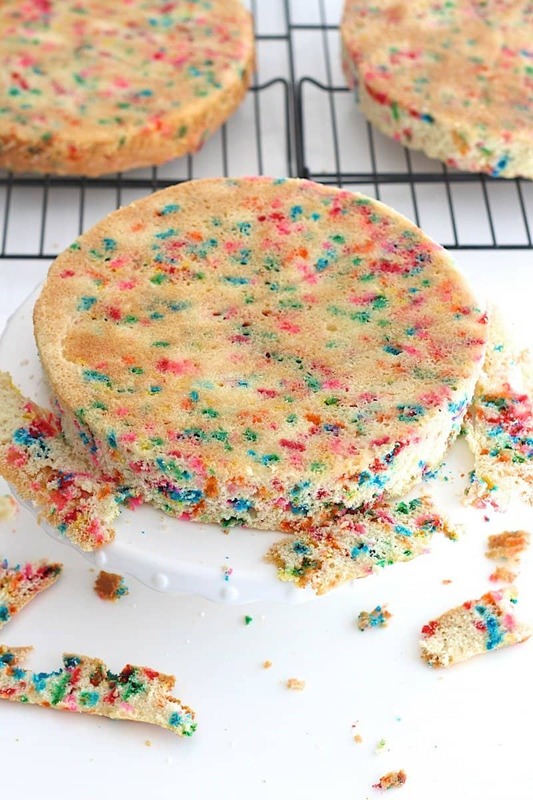 This naked confetti cake is a celebration in itself! 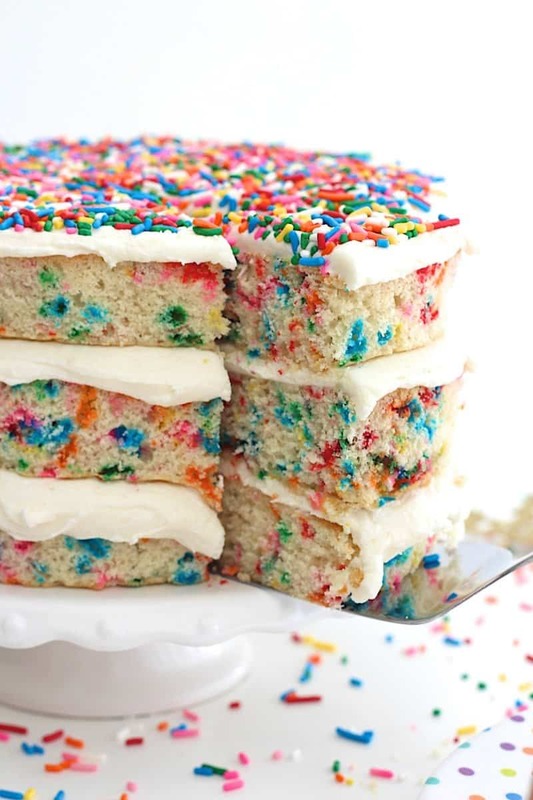 Buttery moist vanilla cake bursting with rainbow sprinkles is layered with a creamy vanilla buttercream frosting and topped with even more sprinkles. Party!! I love baking and of course eating cake, but I’m no professional when it comes to decorating one. That’s what I love so much about the whole naked cake trend. It’s amazing how gorgeous a cake can still be by just showcasing it as is. No fuss with frosting the whole cake to make it look fabulous. 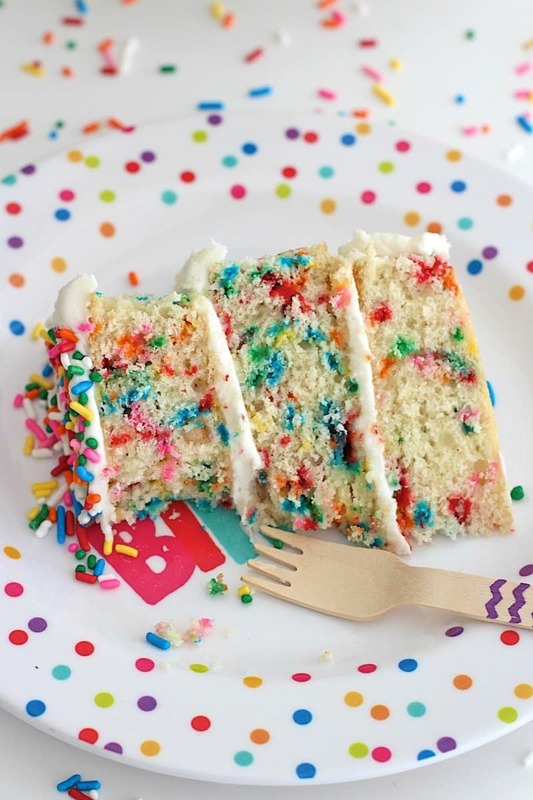 This confetti cake is the perfect cake to leave “naked” because the rainbow sprinkles are baked in decorations. 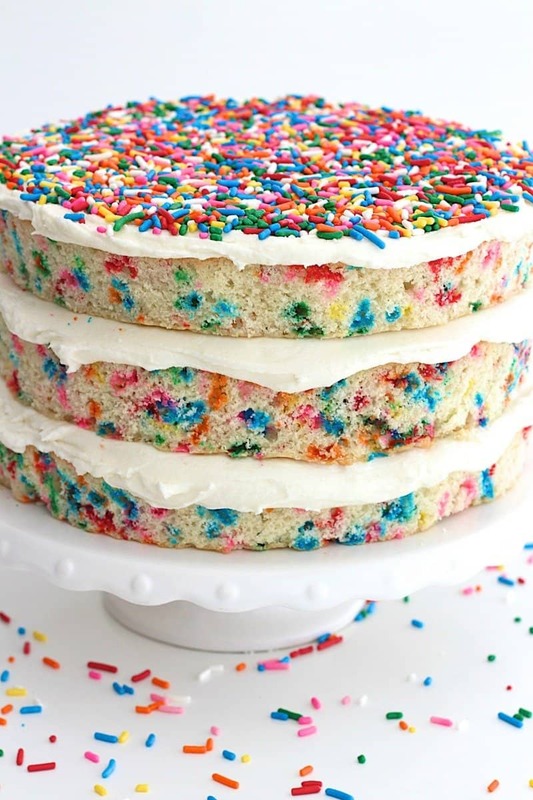 By trimming the outside edges of the cake, the eyes get an exciting glimpse into all the sprinkles inside. 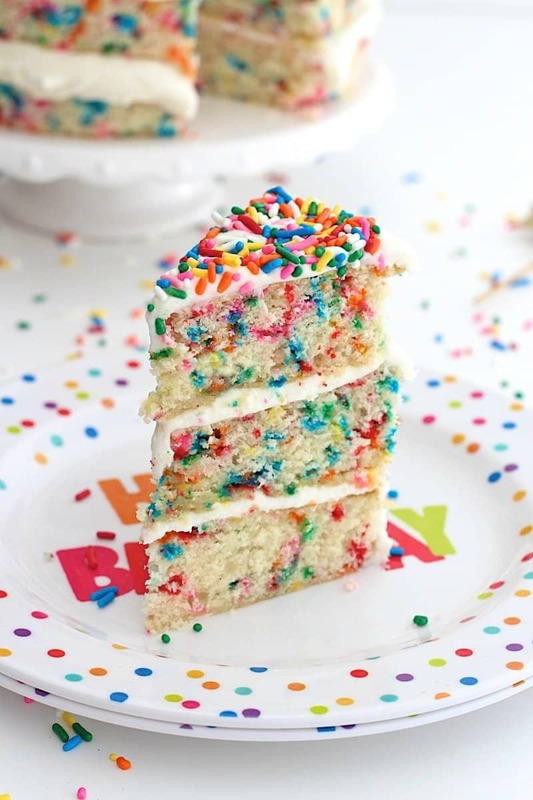 And who doesn’t love sprinkles?! 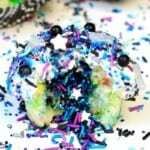 Skip the mix and let me show you how easy it is to bake a great confetti cake from scratch that you can be so proud of. I decided to trim around the edges of each cake layer to expose the sprinkles and I love how fun and festive it turned out. Ta-da! 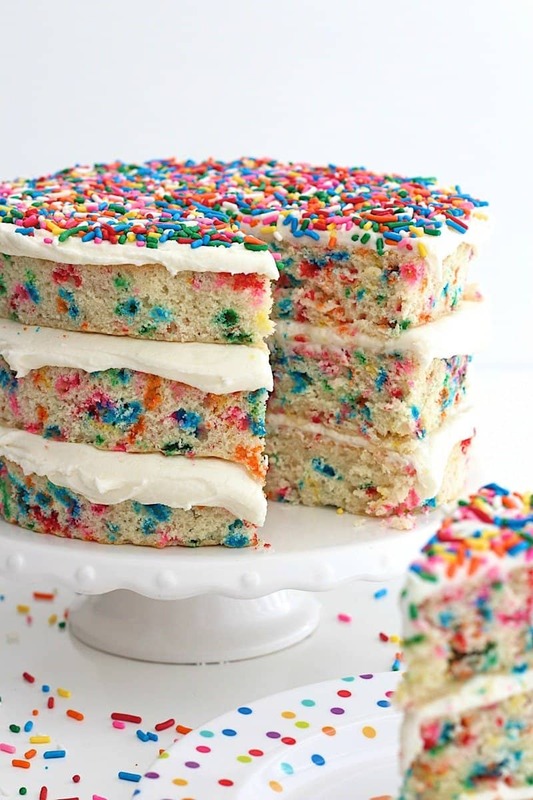 A homemade confetti cake that will bring a smile to everyone’s face! 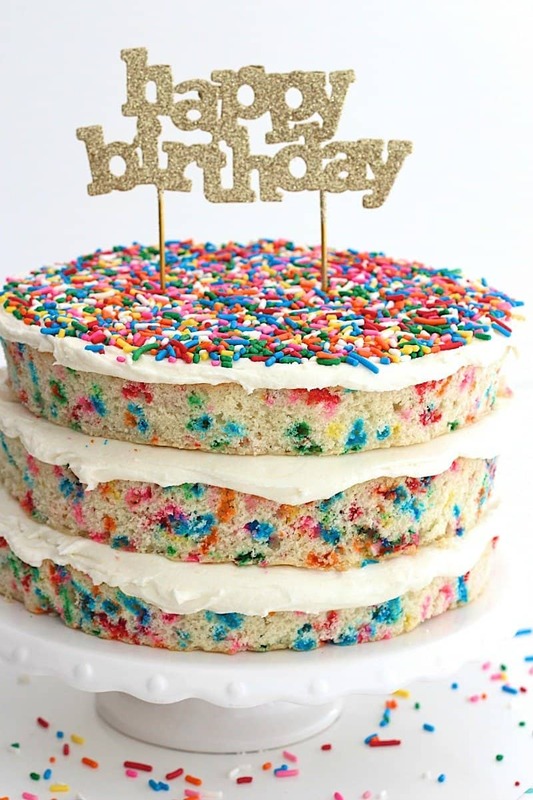 There’s just something so fun about a cake filled and topped with sprinkles. Serving it up to your loved ones will be something special! We’ve all given this cake two thumbs up and the boys have even asked if I can make one for their next “real” birthday. Best compliment ever! 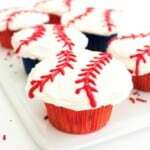 I hope you have a reason to celebrate soon so you can bake and enjoy it ASAP! Trust me, it’s so easy, so fun and most importantly, so delicious!! Preheat oven to 350°F. Line the bottom of three 8-inch round cake pans with a piece of parchment paper cut to fit. Lightly grease and flour both cake pans and set aside. In the bowl of an electric mixer fitted with the paddle attachment, beat the butter and sugar until very white and fluffy, about 4 minutes. Beat in the eggs, one at a time, making sure each one is well incorporated before adding another. Mix in the vanilla. With the mixer on low speed, alternate adding the flour mixture and the milk, ending with the flour mixture, until batter is smooth. 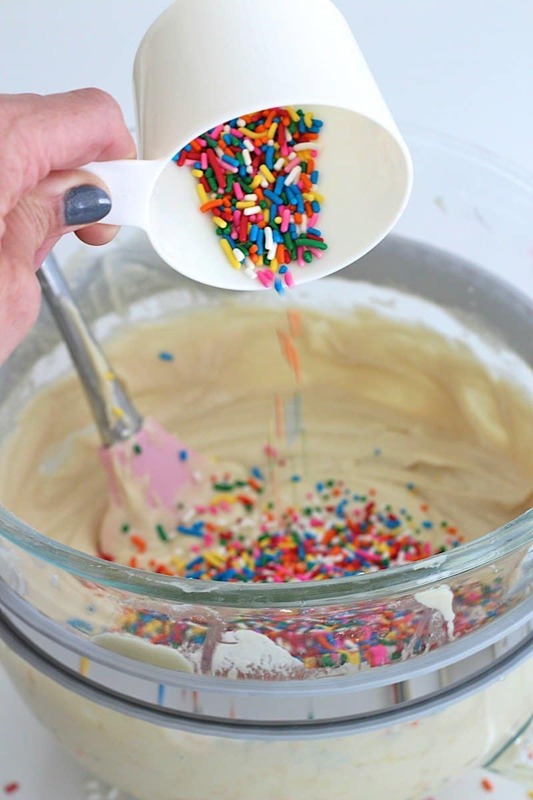 Fold in 1 cup rainbow sprinkles with a spatula. 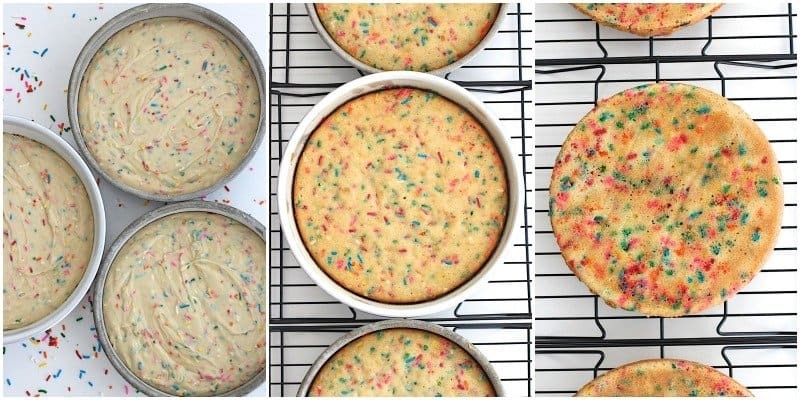 Divide batter evenly among prepared cake pans. 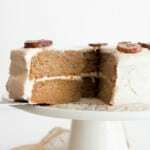 Bake cakes for 25-30 minutes or until a toothpick inserted in the center of each cake comes out clean. Let cakes cool in pans for 15 minutes before running a sharp knife around the edges turning out onto wire racks to cool completely. To make the frosting, beat the butter and cream cheese together in the bowl of an electric mixer fitted with the whisk attachment. Add the salt and vanilla. Beat in the powdered sugar, 1 cup at a time, until well combined. 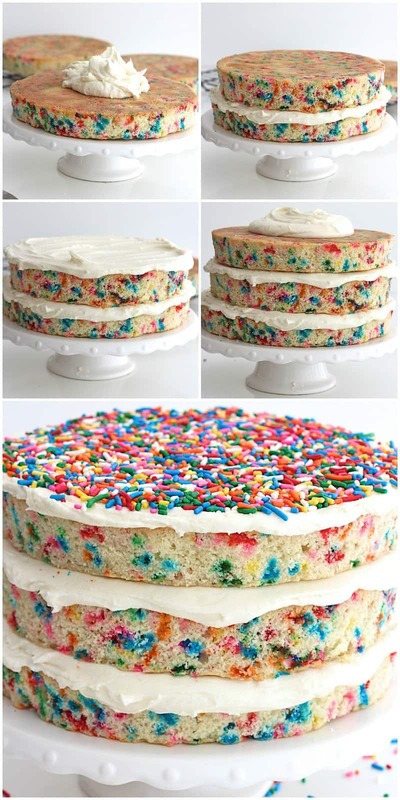 Add 1 tablespoon milk and beat on medium-high speed until frosting is fluffy and of spreading consistency. Add additional milk if the frosting is too thick or additional powdered sugar if the frosting is too thin to spread. Once cakes are cooled, use a sharp knife to trim around the edges so the inside of the cake is slightly exposed. 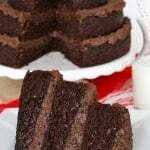 Spread a small amount of frosting on the bottom of a cake stand or cake plate. Place one cake layer, top side down, on the cake stand. Spread a third of the frosting over the first cake layer, spreading it all the way to the edges. Repeat with remaining cakes and frosting. 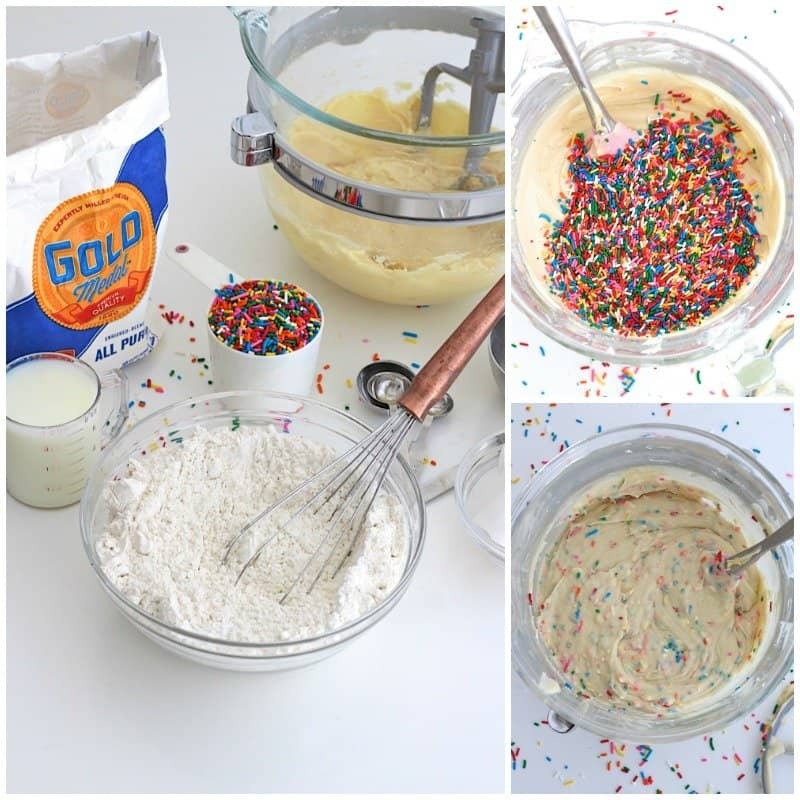 Cover the top layer of frosting with ⅓ cup rainbow sprinkles, gently pressing them into the frosting. Made this cake. My crew found it to be a bit dry. Will add another egg next time. Do you think it would be good to substitute buttermilk with the regular milk? Hi Amy! Absolutely, I’m a big fan of buttermilk in cakes. Great substitute! Enjoy! Can this cake be refrigerated or frozen after it’s frosted or should it only be made fresh? Hi Rachel! Yes, you can refrigerate or freeze it. Just place it in the refrigerator or freezer unwrapped until firm or frozen, at least 4 hours. And then remove it and wrap it tightly in plastic wrap before returning it to the refrigerator or freezer. Hope this helps. Enjoy! 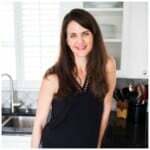 Would you substitute Cake Flour for the AP flour? Thanks! Hi Whitney! I haven’t tested the recipe with cake flour, but I recommend: to substitute cake flour for all-purpose flour use 1 cup plus 2 tablespoons cake flour for every cup of all-purpose flour. Hope this helps. Enjoy! Hi Katie! This recipe does not call for cake flour. If you want to substitute cake flour: To substitute cake flour for all-purpose flour use 1 cup plus 2 tablespoons cake flour for every cup of all-purpose flour. Make your own – one cup sifted cake flour (100 grams) can be substituted with 3/4 cup (85 grams) sifted bleached all-purpose flour plus 2 tablespoons (15 grams) cornstarch. We r trying this cake for a wedding. How long do u think we can have this cake sit out before drying out? With the sides cut off. Concerned if I do it the night before (it’s a 2 o’clock wedding) it will be to dry. Thoughts? Could I add pudding in the mix somehow to help with that? Hi JJ! What a great cake for a wedding! I just might have to crash this wedding ;);) So there are a few things you can do to ensure the cake stays moist if assembled and decorated the day before. 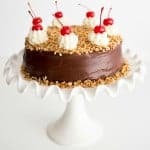 I wouldn’t recommend adding pudding mix to this recipe because it might make the cake too moist to hold up when layered and when trimming the sides off. First of all, be sure not to overbake the cake which is usually the reason most cakes are too dry. I would also recommend baking the cake 2 days before, wrapping each layer tightly in plastic wrap and refrigerating overnight. This will help trap in moisture. Then after you’ve trimmed around the edges before you frost the cake, I would recommend brushing the cake layers with a simple sugar syrup. 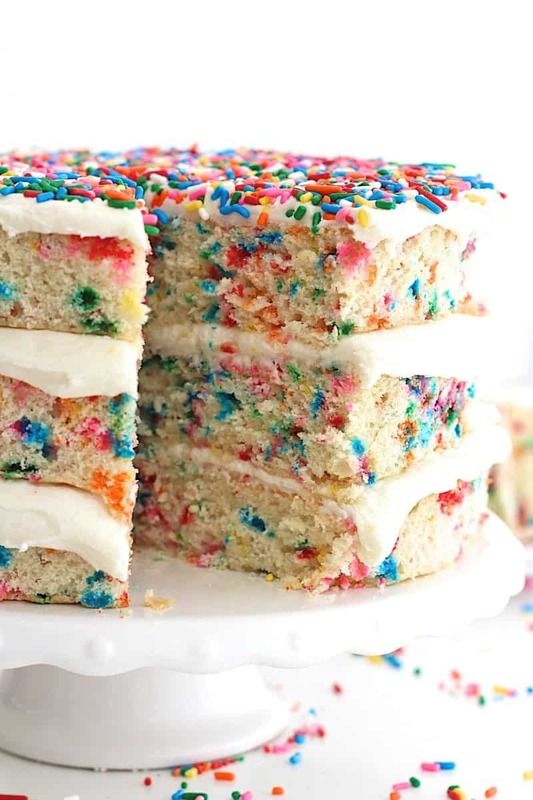 Just boil together equal parts granulated sugar and water until the sugar dissolves, then let it cool to room temperature before brushing it onto the top of and around the edges of each cake layer with a pastry brush. Hope this helps. Enjoy! Could you bake in a sheet pan and then use a round cookie cutter to cut the tiers? Absolutely! Such a great idea! I’m sure they would turn out so cute. Just be sure to check the cake as it bakes as not to overbake it. Enjoy! One other question: do you spread the frosting on with a knife or do you pipe it on? Thanks! transport and am worried about a layer cake sliding. Hi Diana! It will probably just need to bake an extra 5 minutes. Just check it a few times toward the end of the baking time until a toothpick inserted in the center comes out clean. Enjoy! Hi Ashley! Oh no, I’m sorry to hear this. How long did you bake the cake? Sounds like it might have been over-baked.